John Clayton & and Gerald Clayton Tribute To MLK Jr.
SoulPatch Music Productions is proud to present Grammy-winning bassist/composer/arranger John Clayton and acclaimed pianist Gerald Clayton with a program featuring the music of social justice and the civil rights in tribute to the life and legacy of Dr. Martin Luther King Jr.
With two Grammy awards and an additional 10 nominations, John Clayton has gained international renown as a composer, arranger, conductor, producer, educator and an extraordinary bassist in constant demand worldwide. 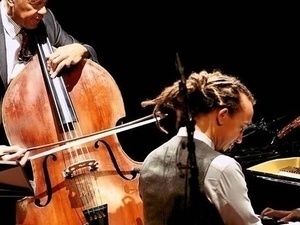 Four-time Grammy-nominated pianist Gerald Clayton is one of the brightest and busiest of the new generation of young stars on the scene today -- one who relentlessly pushes and expands the vocabulary and the boundaries of jazz. The performance will also feature Portland’s BRAVO Youth Orchestra’s "Esperanza Spalding String Ensemble" along with other special guests. A portion of the proceeds will be donated to Portland’s historic Vancouver Avenue Baptist Church — a pillar and a stalwart of the African-American community and the only church in Portland where Dr. King preached, giving his sermon “The Future Of Integration” in 1961. This event is made possible by a grant from Regional Arts and Culture Council. SoulPatch Music Productions is a small, Portland-based organization presenting world-class jazz performances in intimate venues and at reasonable prices.